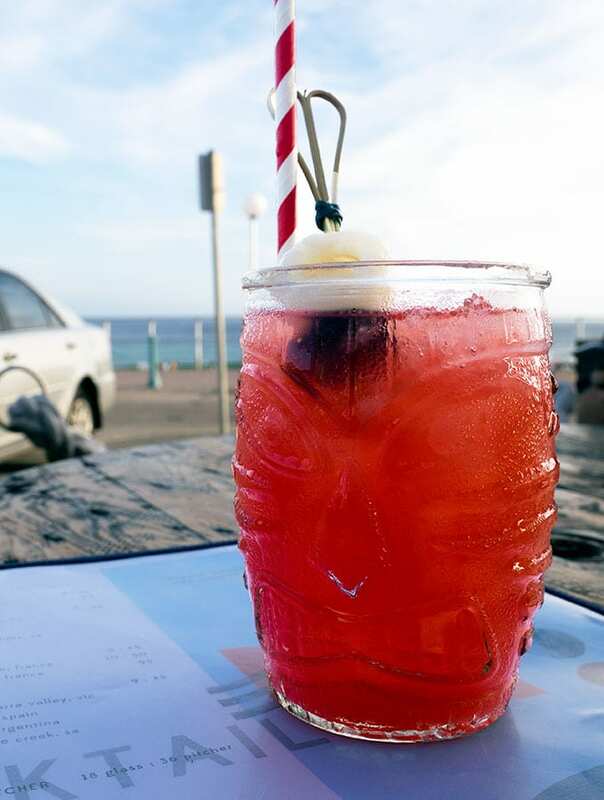 Home » The Bucket List Bondi – Dog Friendly Dining with a View! 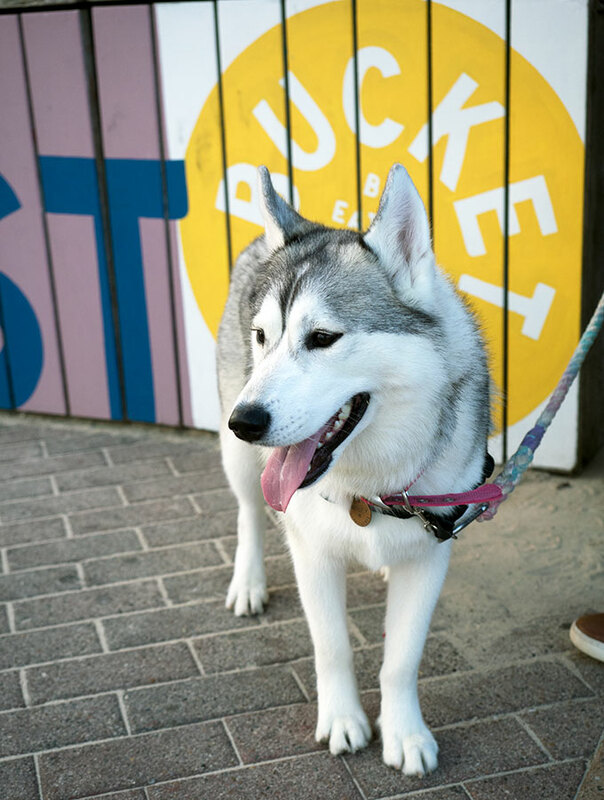 The Bucket List Bondi is located right on Bondi Beach, offering dog friendly dining with a view. 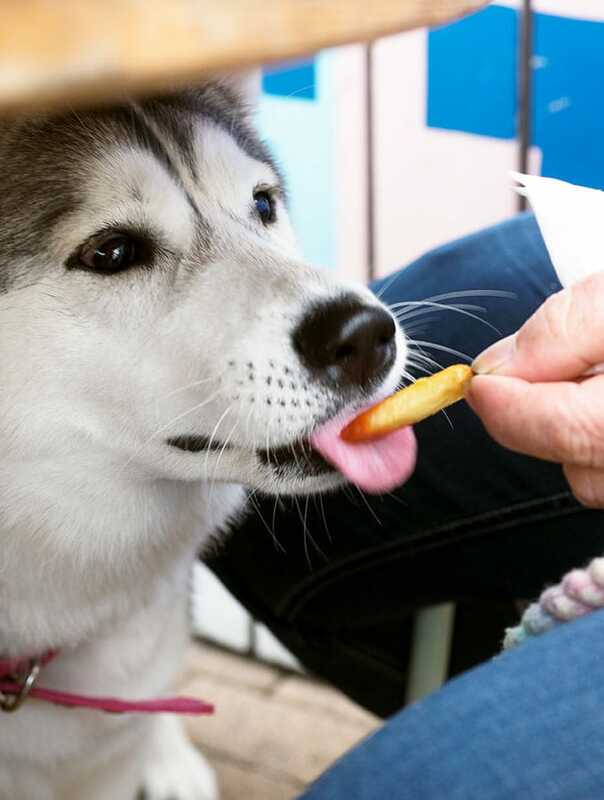 Stop in for a drink, a light snack or complete meal with your fur baby. 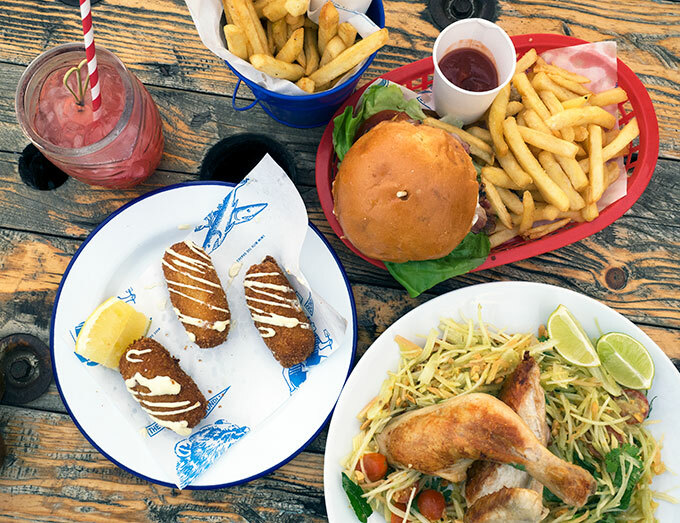 As far as location goes, The Bucket List Bondi has you covered. Situated in the Bondi Pavilion overlooking iconic Bondi Beach. 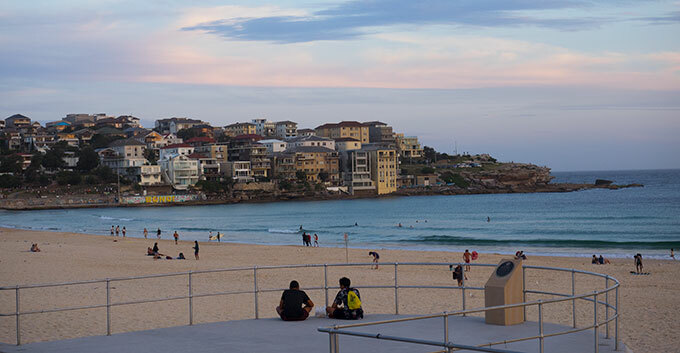 The Bucket List is aptly named, Bondi Beach is on most tourists’ bucket list when they visit Sydney. 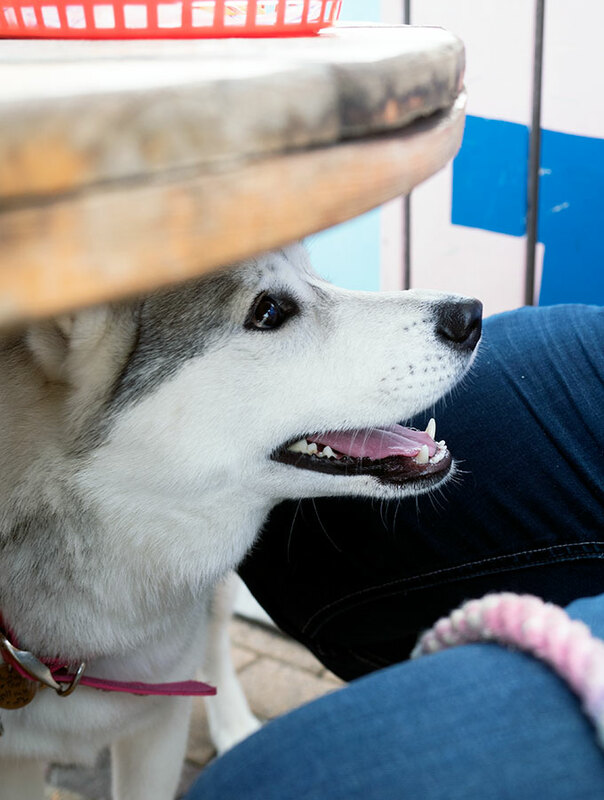 We are slowly making our way around dog friendly dining places in Sydney with Harley. I have to say that there are no complaints from her whatsoever. Trust me to have a foodie fur baby. Considering Harley has just turned 12 months, she is incredibly well behaved when dining out. As she has been socialised with other dogs since a puppy and loves people, Harley is the perfect dining companion. So far we have only had one dining accident when she enthusiastically jumped up at waitress bringing me an espresso. My fault completely for not being on the ball and as penance I wore the coffee. 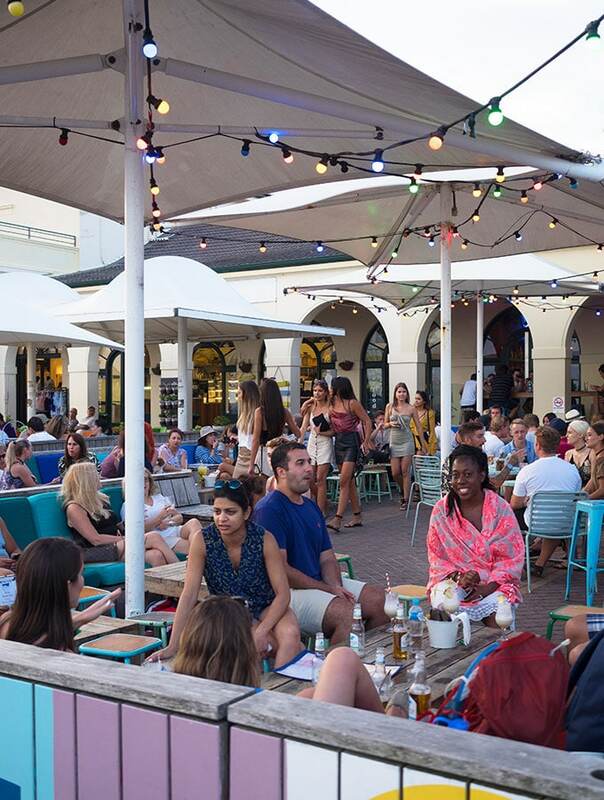 If your dog doesn’t like people and isn’t social with other pups, then I do suggest heading to The Bucket List Bondi during their quieter times. The place was packed when we arrived for an early dinner. 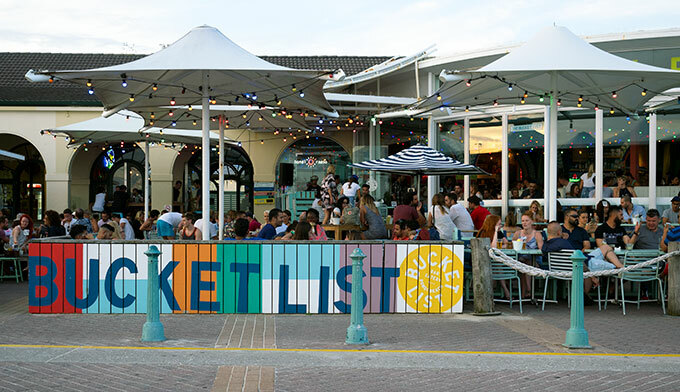 The Bucket List Bondi does take bookings, but only for inside tables. The outside seating is free for all and the dog friendly dining area. We were lucky to grab a table, which was slightly segregated from the rest of the seating area. It was a large wooden cable spool that had been upturned to become a table. The table is in the far right corner of the outside area when looking at the restaurant. It is my pick if you are visiting with your pooch. You may be a little away from most of the action, but your fur baby has a nice secure area where they won’t get stood on. Plus they have an uninterrupted view out to the beach and can people watch. Between people watching and making best friends with The Bucket List security guy, Harley was in her element. You are unable to order food at your table, food orders need to be placed inside. You will receive a table number, and once your order is ready, it will be brought out to you. Drinks also need to be orderd inside. Even though orders are placed inside, empty plates and glasses don’t hang around on your table too long. Staff are pretty on the ball on removing them once you have finished. We start with drinks, ciders, soft drink and a cocktail are ordered. I decided to try the Wave Racer Cocktail, which is made with Gordon’s Gin, lychee and H2 Melon watermelon juice. It’s the perfect summery beachside summer drink. 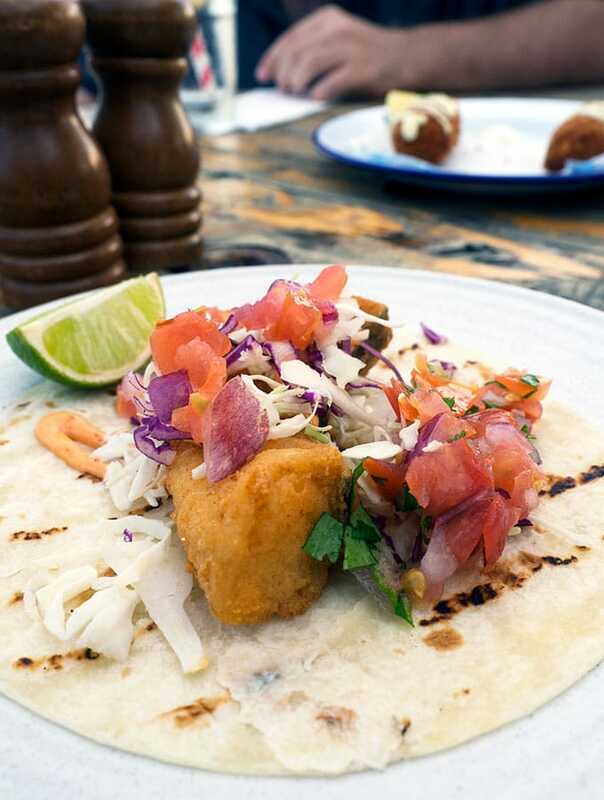 A small tortilla is topped with a juicy piece of fried fish, pico de gallo, shaved cabbage, chipotle mayonnaise and salsa. It is served with a wedge of lime on the side. At $9 per taco, these aren’t the cheapest tacos in Sydney, but definitely go down well with a cocktail or cold beer. The Bucket List has daily specials and on the day we visited the market fish of the day was Barramundi. On offer was also freshly shaved free range ham dish and a chorizo roll. 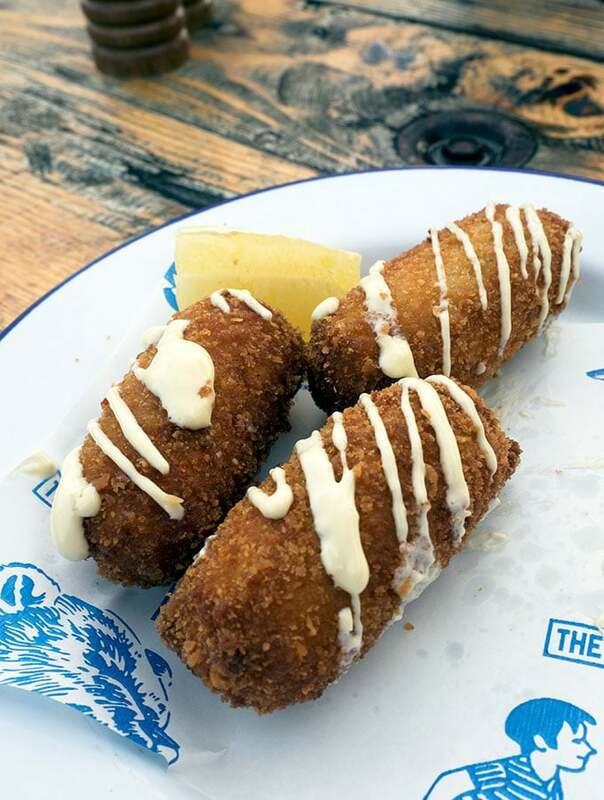 We decided to try prosciutto and mozzarella croquettes which were also on the daily specials’ list. 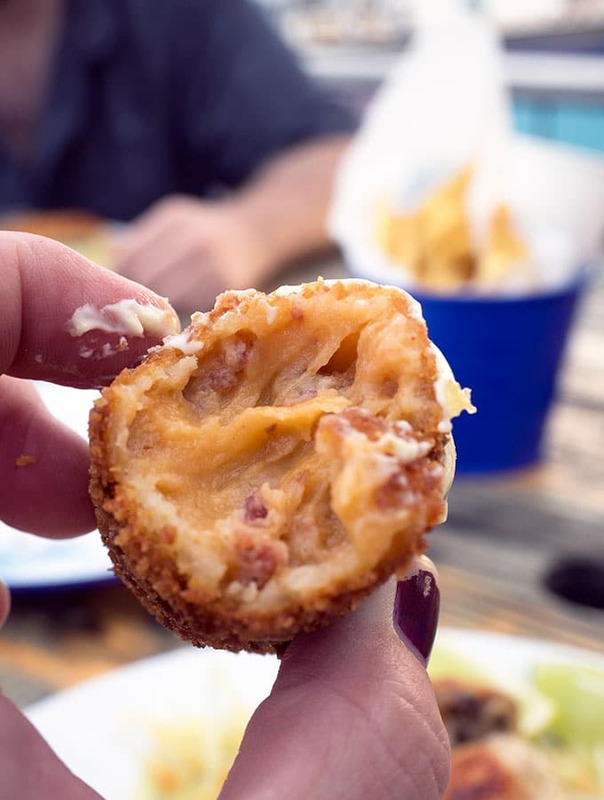 If you love gooey cheesy goodness, then these are for you! The Bucket List hot chips with their own seasoning. The chips are crunchy on the outside and fluffy on the inside, just how a good chip should be. They are served with a side of tomato sauce. 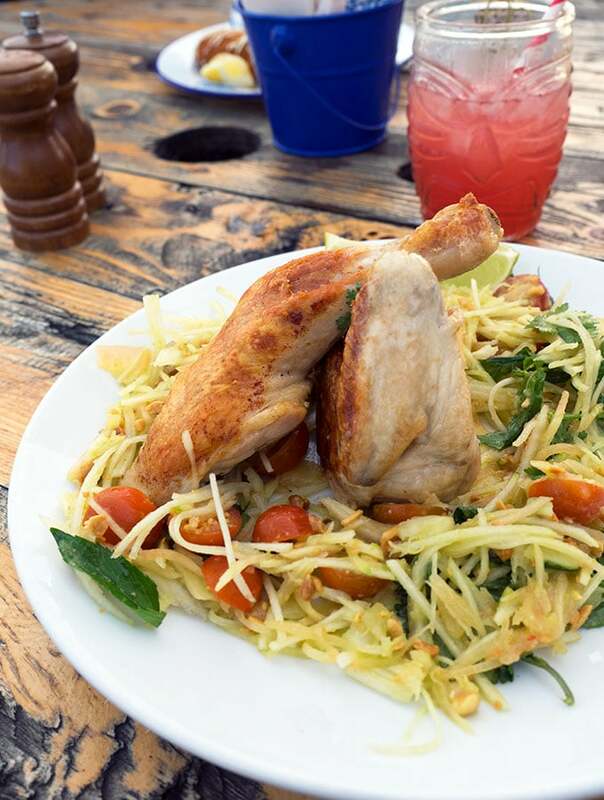 One of the healthier options on the menu, plus a gluten free dish. You get half a chicken which is nice and juicy, still on the bone. This accompanied with a green papaya salad with cherry tomatoes, peanuts and herbs. This is all then drizzled with a jalapeno and coconut dressing. 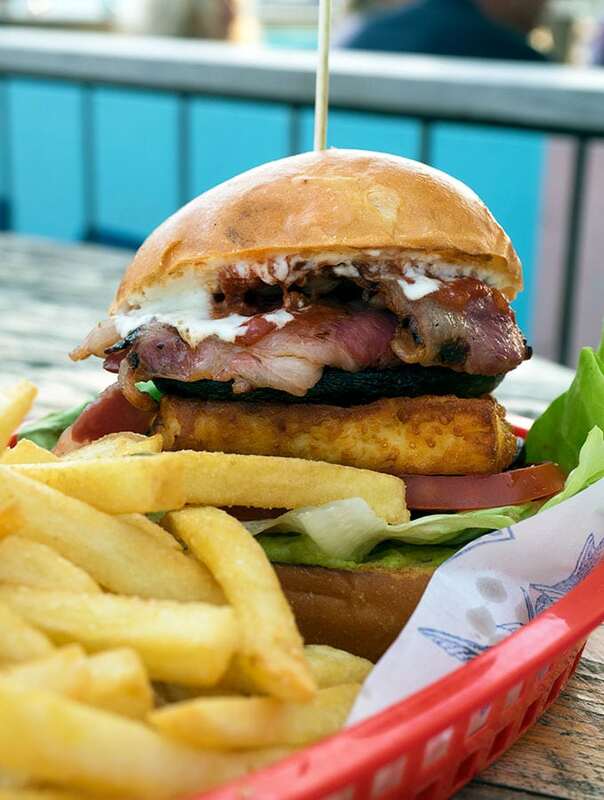 The roast mushroom and haloumi burger is The Bucket List’s vegetarian burger option. That is unless you order bacon to go on it for an extra $3. The burger comes with a large grilled field mushroom, deep fried haloumi, beetroot, avocado, tomato, lettuces and tahini yoghurt. Plus there is a decent portion of chips on the side. Our buttermilk fried chicken went MIA and we had to chase it up, which was a shame as it was Josh’s main. Mac scoffed his burger, I ate my chicken and Josh looked on sadly. Once chased up it turned up pretty quickly, but unfortunately, it was a little on the “over fried” side. Even though it was more coffee coloured than golden the chicken was still juicy on the inside. What really makes this dis is the serving of bread and butter cucumbers with it. They add a lovely sweet and sour note alongside the smoked chilli mayo and wedges of lemon. 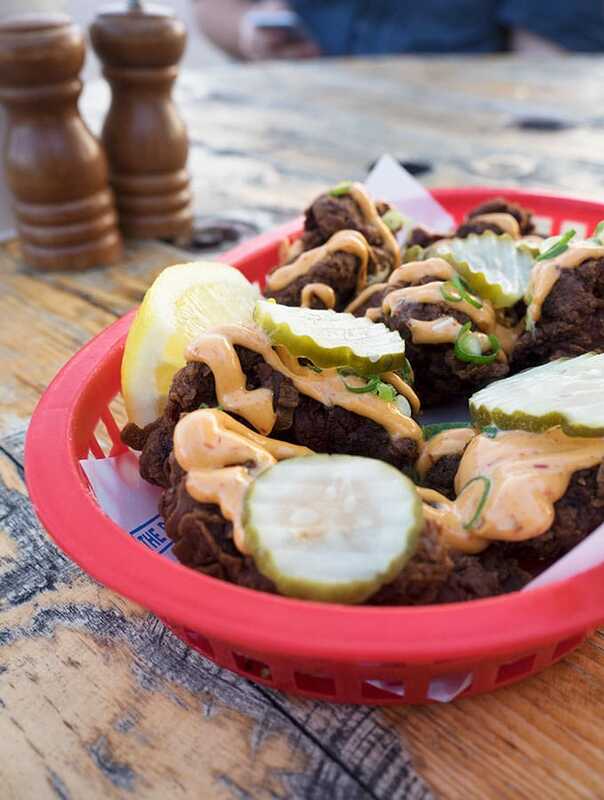 Our buttermilk fried chicken was a bit of a fail, but the rest of the dishes were enjoyable. 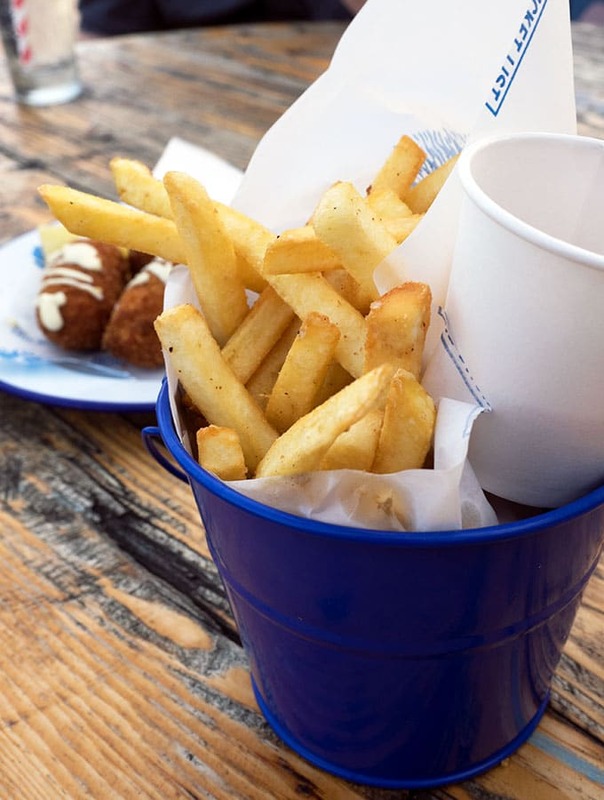 The Bucket List Bondi does offer something for everybody. There is a range of healthier dishes alongside burgers and fried food. If you just feel like having a few drinks and some “bar” food they have you sorted in that department as well. 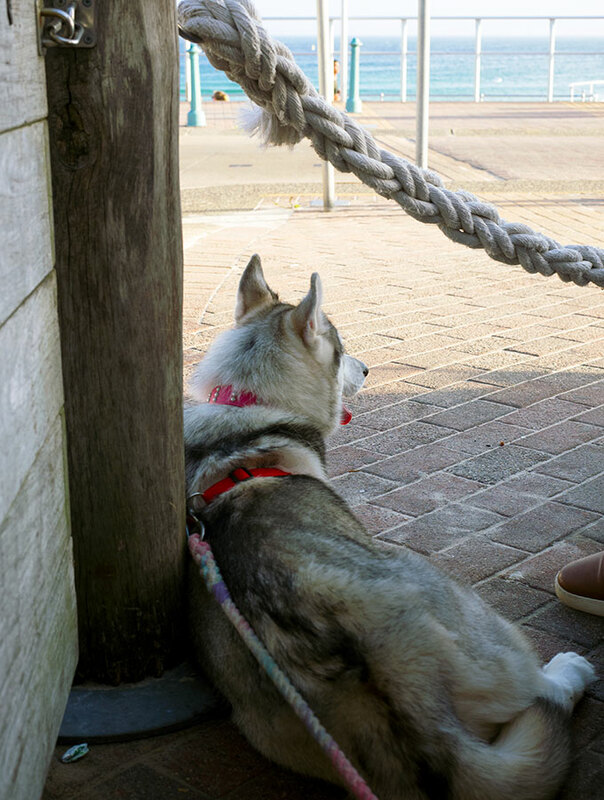 It is definitely a great spot to chill out with your pooch, people watch and enjoy a cocktail, two or three. Will Harley and I go back? I do want to give them a second chance on the buttermilk chicken. Plus you can’t beat the view, it’s a great dog friendly dining option in Sydney. 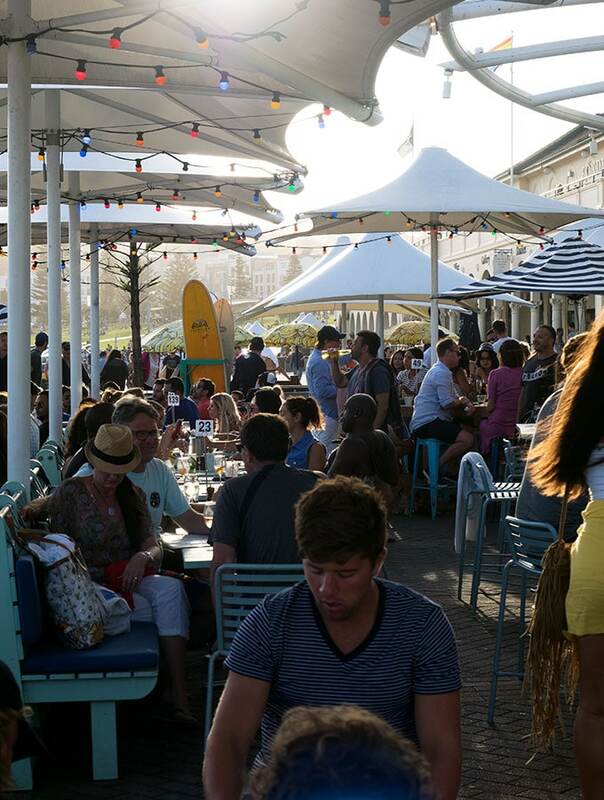 We dined as a guest of The Bucket List Bondi with much thanks. Who should dine here: Caters to everybody. Who shouldn’t dine here: Those wanting complete table service. 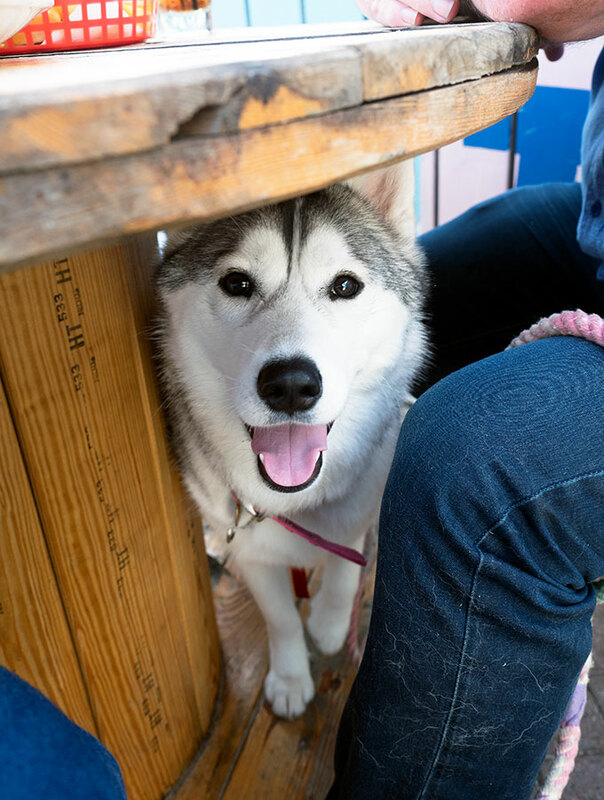 What else you should know: Dog friendly dining area outside for you and your fur baby. Bookings: Inside only, outside no bookings taken.